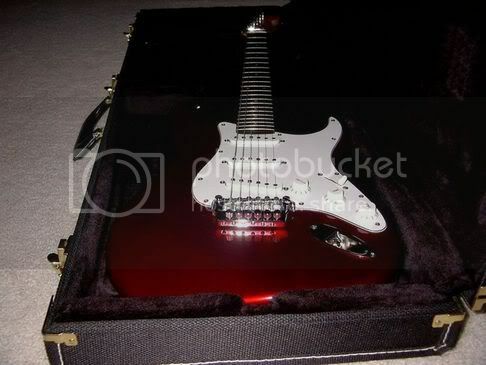 The purpose of this thread is to have a database of guitars that people own/use so that others could send PMs to those users to ask direct questions. This wouldn't end the "What do you think of guitar (x)?" threads, because I think that those are important, but it definitely would serve as a good resource. This database will be for electric guitars and acoustic guitars, mostly factory made, but I'll reserve a section for luthiers and builders. Your gear will not be added if you have fewer than 200 posts. The list will also be purged of users that have not logged into CGR in over a year. These measures were made to prevent cluttering of the list with inactive members. Please do not request your gear to be added if you have not owned it for at least three months and still have the intention of keeping it. Name your guitar model, cite any changes from stock hardware (tuners, pickups, bridge, etc.). If your guitar is a custom model, there's no need to list all of your specs, just note it as custom. You can cite the pickups used. Don't be afraid that you're putting too much detail...the mods will decide what is pertinent and what is too much. Name your guitar model, if there is an aftermarket pickup, cite it, if you have a pickup which is stock, there is no need. Name the style of the body, or at least the best way you can describe it, list the pickup configuration, and if you bought the body or neck from a company, name it. 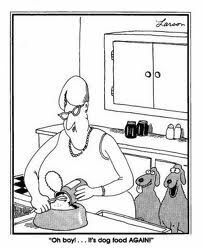 If you are a luthier, I figure I can just list you as a luthier. if you'd like to include links to pictures of your guitars (perhaps posted in the Official Gear Picture Thread or in another post, please provide a link to your picture(s) (or the post(s) they're in) and we will add them next to your guitar. Please do not upload your picture into this thread as it will be disregarded. Also, if you already have a picture in the OGPT please find it...don't make a duplicate post in there just because you were too lazy to find the original. Finally, original user pictures only please. If I wanted to see the stock photo on MusiciansFriend.com, I'd go look there. I want to see what the real thing looks like. Your posts will be deleted. Last edited by Reno Rattler; 03-09-2010 at 10:13 PM. Seagull Performer CW Mini-Jumbo Flame Maple. Nightshade - Unique body, Adeson Lucifer and Classic British pickups, Carvin neck. Telecaster - Hemlock barn beam body, Warmoth Wolfgang profile neck, medium jumbo stainless steel frets, Planet Wave auto-trim tuners, Wilkinson bridge, Lindy Fralin Blues Specials pickups. Last edited by Leboman; 10-03-2018 at 03:41 PM. Reason: Short round of updates. "I'M GONNA GIVE YOU A BAD CASE OF SOMBODY SHOT ME IN THE HEAD"
Last edited by thesteve; 11-09-2011 at 12:41 PM. I'll leave it to you to decide if the Godin is acoustic or electric. You could also add the SugarBear-a-caster. 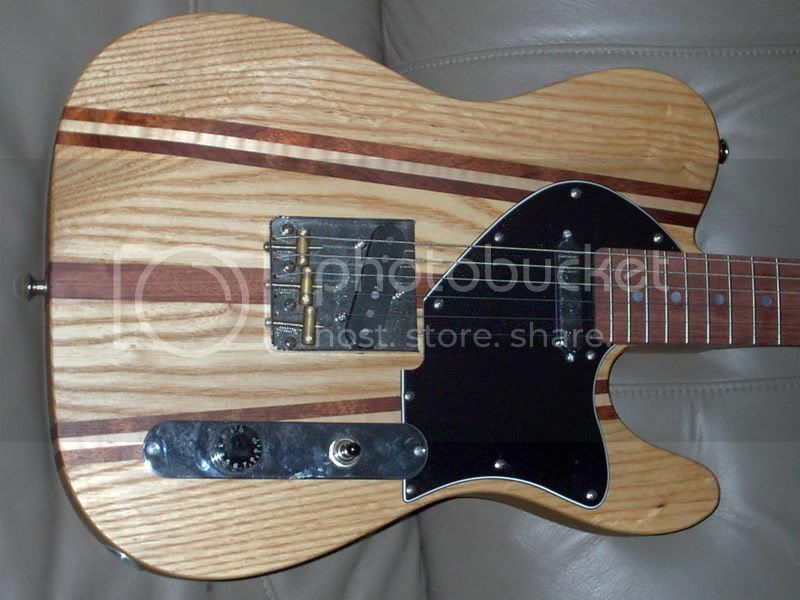 Tele shape, ash with maple and bubinga stripes, bubinga neck. Fender SCN neck, Dimarzio Area T bridge. 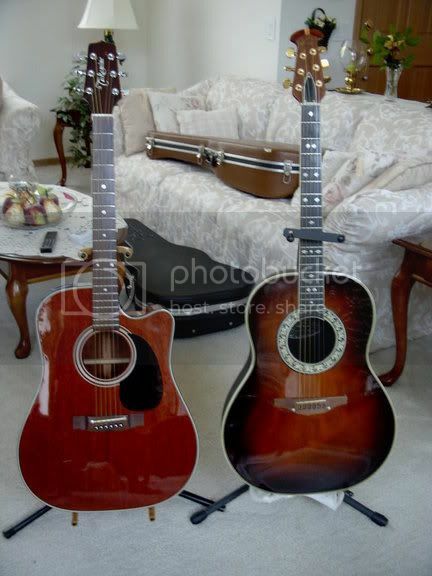 I've been on a guitar buying kick ever since I've had a job... Here's the latest. You can add these if you want, or not. I just added my Epiphone Les Paul Standard. 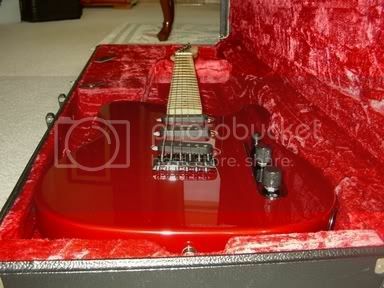 Which I then sold and replaced with a Jackson Dinky Reverse. You can include me for an Epiphone ES-339 (electric), an Ibanez RS540P (electric), an Ibanez AW100 (acoustic), and a Yamaha CG100 (classical). I didn't see those in the list. Everything else I own is already covered, but if you like you can add me to the Epiphone LP Standard and the Fender Standard Stratocaster. Thought I'd throw a couple recent buys on here since nobody else has them listed. If the question concerns me, the answer is either 12, Fish!, or anatomically correct. PRS Custom 24, w/ Seymour Duncan JB (bridge), and Duncan 59 (neck). It's also been refretted w/huge 6000 fret wire. 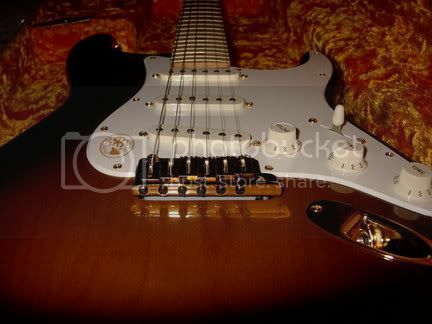 USA Strat, rosewood fretboard, Duncan JB (bridge), Duncan Antiquity single coils (neck & middle), refretted w/6100 fret wire, Buzz Feiten tuning system, and Sperzel tuning keys. 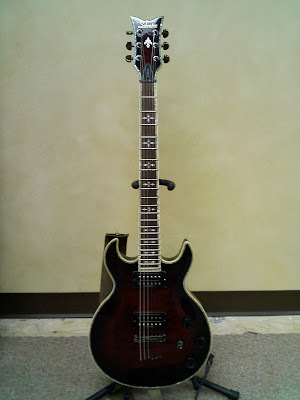 This guitar is probably my favorite, almost plays itself and it looks just like Jake E. Lee's guitar. 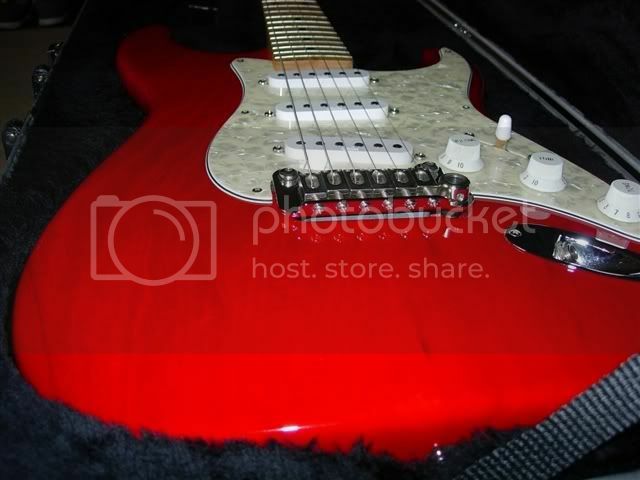 USA Strat, maple neck, Duncan JB (bridge), Fender Texas Special single coils (neck & middle), refretted w/6000 fret wire, and Sperzel tuning keys. Early to mid 80's Kramer Pacer, Duncan JB (bridge), Duncan 59 (neck), refretted w/6000 fret wire, original Floyd Rose. Warmoth custom Strat - Swamp ash body, Duncan JB (bridge), Fralin Blues Special (neck & middle), rosewood fretboard - 1/2 scallop (12-22), Buzz Feiten tuning system, Sperzel tuning keys. As for amps, I have a Splawn Quick Rod 100 watt head and a Mesa Boogie Dual Rectifier head (one of the original 2 channel models). A Marshall 2x12 and a Marshall 4x12 (w/Celestion Vintage 30's). Effects - Fultone Clyde Wah, Fulltone Fat Boost, Fulltone Fulldrive, Voodoo Lab Micro Vibe, Voodoo Lab Analog Chorus, MXR Phase 90, Boss OC2 Octave pedal, Danelectro Dan Echo Dealy pedal, Boss TU3 Tuner, Ernie Ball Volume Pedal. I think that's all. Oh wow, I forgot about this thread now that I am a mod, I'll clean this up when I have time, however, amps and effects have their own forums so you should put those there instead. Also, we don't add people until they have 200 posts, I'll leave the post though and if/when you hit that theshold, I'll add you. Last edited by Ax; 10-22-2013 at 06:19 PM.